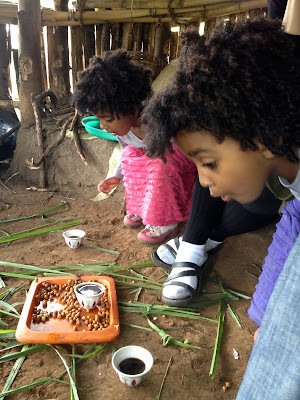 We have had an exciting day, starting with me going to market and forgetting my amharic words and using smiles and gestures to getting our first invite to a house and drinking coffee and eating potatoes with a family. In the meantime, one picture will do. We are loving the pasture across the road. We have met many kids and are starting to recognize faces and get a slight grasp on who belongs to who. The Littles have, on their own, started asking to wear scarves all day and when we go out, we must first look for "shepherd" sticks. I was calling Little J's name and she wouldn't respond, she finally said, "I am not Little J, I am a shepherd girl". Thank you all for your kind words and prayers. You know how you move to a new place and think, "How will this ever feel like home?"? but before you know it, it does. Yesterday, working in the kitchen of our blueberry house, I was washed in a feeling of homecoming. I know you are anxious to see more of our house and surroundings and that will come! As you have picked up from our surroundings, it is STUNNING. One of the most beautiful places I have ever seen. Different than anything I have seen before. Every week day at the 5 F's project (which is a walkable distance for The Littles and I) there is an afternoon coffee time. 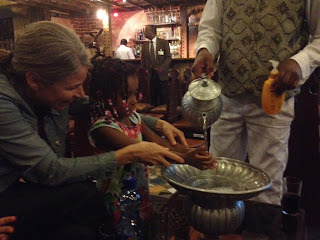 Coffee in Ethiopia is a big deal and it is a somewhat formal occasion as well. There are three rounds of coffee (representing different spiritual things, still trying to get to the bottom of this as the answer depends based on the person's background). Once you start the first round, you stay put for the next two. Depending on the region, it can be different but here, the first round is coffee with salt, the second round is coffee with salt and sugar and the last depends on what is available. Sometimes it can be cream, sometimes more sugar, sometimes butter. The Littles were delighted to attend and have since been quite grumpy when they hear they have missed it. It is a good thing they are cute as we hammered through our first ceremony, teaching The Littles left apart from right as it is polite to use your right hand and blundering through other cultural issues. Our new friends were so gracious and amused. So thankful for this response! Though yesterday I wrote about times of sorrow, we are really so glad to be here. Just in awe of God and His people. And this one is maybe a framer. Jon figured out our lack of internet situation. I danced around the kitchen with glee. Mom's time with us was just that. Our gratefulness knows no bounds to Mom for coming and for Dad for supporting us by encouraging her to come and also to lengthen her trip so she could see us through to Injibara. She walked down roads with us that most parents never have to see their children and grandchildren through and did it in a way that made us feel like it was her joy and a privilege. This is our view across from our house. A pasture situated in front of a mountain. As we pulled out from dropping Mom off, tears were streaming down my cheeks. Saying my "last goodbye" severed my connection to home. I knew we would all miss her terribly. The Littles were sad but trying to make sense of it all. Unprompted, Little A started to sing loudly and incessantly and Little J joined in. They repeatedly sang, "Blessed by the name of the Lord, Blessed be the name. Blessed be the name of the Lord, blessed be your glorious name. He gives and takes away. He gives and takes away, my heart will choose to say, Lord blessed be your name." Yesterday, Little A came to me in tears because she had just been to Nana's room and Nana wasn't there. By the grace of God, I smiled and explained the concept of a guest room and talked about our next visitors, Doug and Jill filling the room in about a month. I turned my face back over the stove and wiped away tears before they fell into the spaghetti sauce. Little A asked to go "home". I value transparency and honesty and for now, will continue with my gut level responses here. The question rolled around my mind, "How is this worth it?" 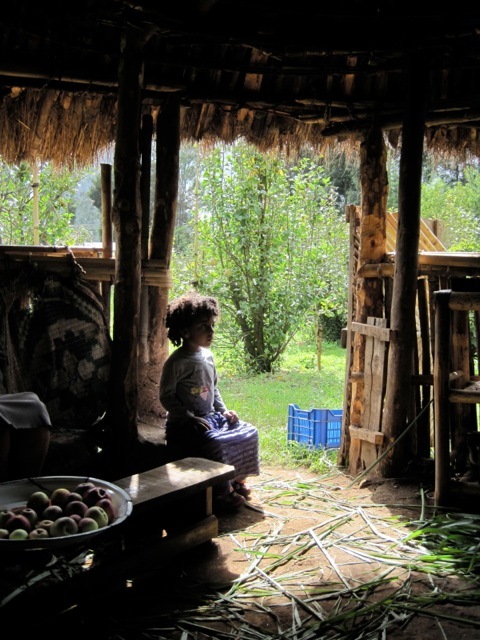 I am standing in a kitchen in the middle of Ethiopia, away from everything I know and everyone. I am incompetent at everything here. I can't even string together a sentence in Amharic and haven't even learned one word of the Awi language. The Lord met me in the kitchen and comforted my heart. Yes, it is worth it. There is no sacrifice too great for my God. I have the joy of moving forward in obedience to Him. We are doing well, rejoicing in God's promises and basking in the wonder at the beautiful culture He has put us with. I can't wait to see how God is moving here. Among the Awi and in our hearts. Oh my. I've got so much to tell you. We are well and I am still figuring out the internet here. It looks like this is possible, just slow. :) I'll take it! On Friday we made the 10 hour trip up to our mountain. We are highlanders now, it's kind of surreal. There is much to show from the trip but I am going to highlight the Blue Nile Gorge. Oh yes, and the baboons. Here is a cute baboon family. Notice the uneven surface. This is a paved part of the road but all the weight over the past several years have caused the earth to move and make for some bumpy surfaces. You guys, we made it here. The drive was breathtaking. We head out tomorrow morning, 6:00 am here 11:00 pm Eastern time. 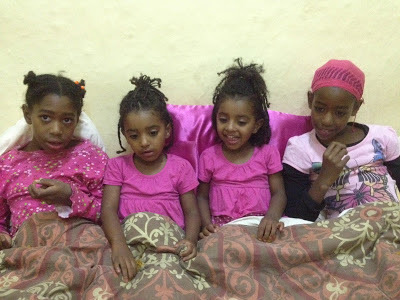 We are all so excited to see Injibara and so glad that Mom decided to extend her ticket and travel with us. Thanks to my Dad too for so unselfishly sharing her! Please pray for a nice, boring trip. ;) pray for calm hearts and peaceful minds and hearts full of faith in God's goodness and provision. Rewinding a few weeks, The Littles enjoyed a royal send off from Sunday School. Their dear teachers had thought of everything, complete with a working drawbridge, horses and a royal feast. Little A informed me before the day that "they can say goodbye to themselves". Neither of the Littles fully enjoyed it because of their apprehension about leaving and goodbyes. It is something that made them feel so special though and it is so cool to have their classmates involved in the sending. Adilynn comes in through the drawbridge that the knight let down. All dressed up many places to go. Stu led all the kids on horse rides. Everyone had their own horse to ride. The royal and very fabulous teachers. For real. Today we are just. really. good. God has flooded us with peace because of your prayers. We are enjoying each other and this little break in Addis. We plan to leave on Friday morning for Injibara. (Your Thursday night). Mom and Jon went to the airline office in the city, inquiring after changing her ticket so she can still visit Injibara. There may be no change tickets available. We also got to cheer on Ethiopia in their soccer match against South Africa. We could hear the cheers from the stadium and after they won, the celebration was contagious! One thing that has remained the same, we are glad to be here. Thankful and privileged to be an extension of you among the Awi. We sat, warming ourselves in the sun at the police station. I thought to myself, "This is so hard". I immediately was reminded that we did not come here because it is easy. Yesterday, I know many of you were intervening to God on behalf of our family. At 6:00 am, we left the gates of SIM Headquarters, smooshed in our vehicle like sardines between our luggage and each other, excited about our 8-10 hour trip to Injibara. As many of you are aware, traffic in the city is crazy, we drove out of the city and into the countryside. It was beautiful, full of animals grazing, small huts and homes dotting the landscape. 1 1/2 hours into the trip, a woman was on the side of the road, and without looking, stepped directly into our path. Our teammate, Cheryl, honked, locked up her brakes and swerved as far as she could without hitting an oncoming truck. But it wasn't enough. We hit her. A crowd swarmed, many thoughts were going through our minds. I prayed the same thing over and over, "God, help". As we sat there amidst all the people, we prayed for the elderly woman, protection, favor from the people and that God's name would be glorified. I processed that almost everything we own was on the landcruiser and it could all get taken. I mentally prepared myself for losing all of it. A policeman came by taxi and took Cheryl's license and tried to take the keys. This is the policy here. If you hit someone, it is always the driver's fault. Our teammate went to the clinic with the elderly woman and appears she is sore and has bruises. There are many, many details I am going to leave out here but God did intervene and fill us with peace. Our teammate kept the information from us that she was very possibly facing imprisonment. We knew it was serious but not to that level. We hauled the policeman around and another official back and forth between the accident sight and the police station, just flexing and adjusting. The Littles did amazing. They sat quietly, handled the fish bowl effect of the day, worked up the courage to use a FULL squatty potty and spent nearly the whole day without toys and very little food as there were always eyes on us. Long story short, we spent 9 1/2 hours not knowing our outcomes. SIM members from the administration joined us to get through the bureaucracy and process that we did not know how to navigate. 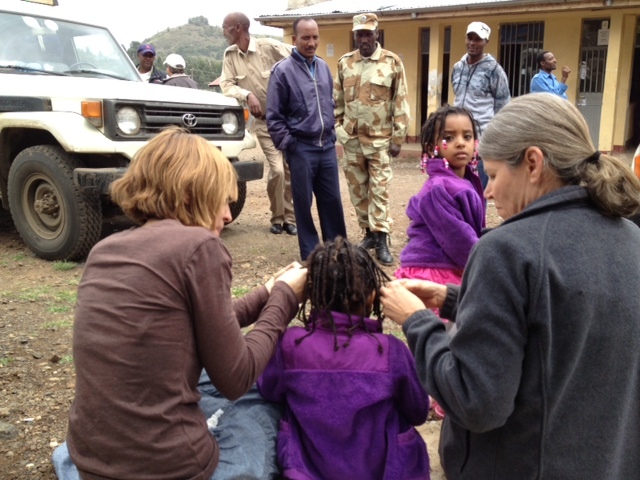 We capitalized on all our waiting by starting to take out braids. This is at the police station. Notice the onlookers. Cheryl talks to kids as we wait in another small town. And I am not sure where I was when Jon took these pictures. Definitely not a Mama idea. Our teammate, Cheryl, was an absolute trooper, protecting us and definitely feeling the additional stress of five passengers with a bunch of luggage that spoke no Amharic. 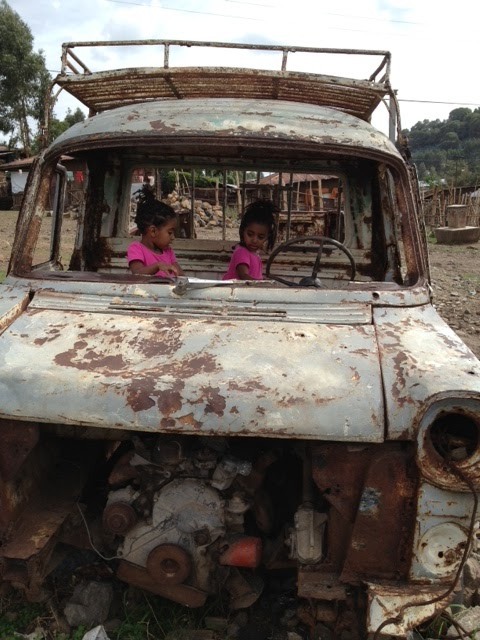 And now we are back in Addis. We debriefed last night, tried to get a good night of sleep and now we wait here for at least today. The elderly woman is at a hospital in Addis and has an appointment today to see about any internal injuries. My Mom was planning on leaving on Thursday and she could use prayers for wisdom to know if she should still depart with her existing airplane ticket or if she stays on to see Injibara. Right now, the 8-10 hours on the road seem very daunting to her. To me too but I know this is my new life. I also know that God is sovereign. I mentioned to Him several times yesterday, "God, you could have stopped this..." I do feel fearful and paranoid. We could seriously injure someone. But I know He is faithful. And statistically, this doesn't happen to missionaries often, so now I guess we have it out of the way. I have told several of you that I feared when we moved to Injibara, we were maybe going to starve. We are going to be fine. :) We leave on Monday morning for Injibara and I spent the last several days learning how to grocery shop in Addis. 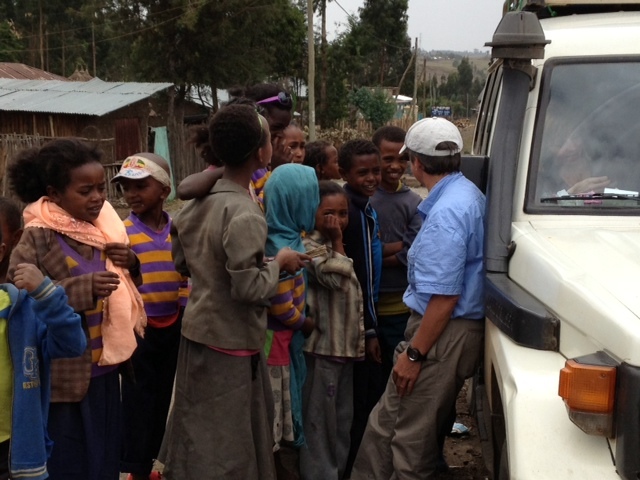 In the remote stations of Ethiopia, there isn't much food availability so you get your staples in the city. 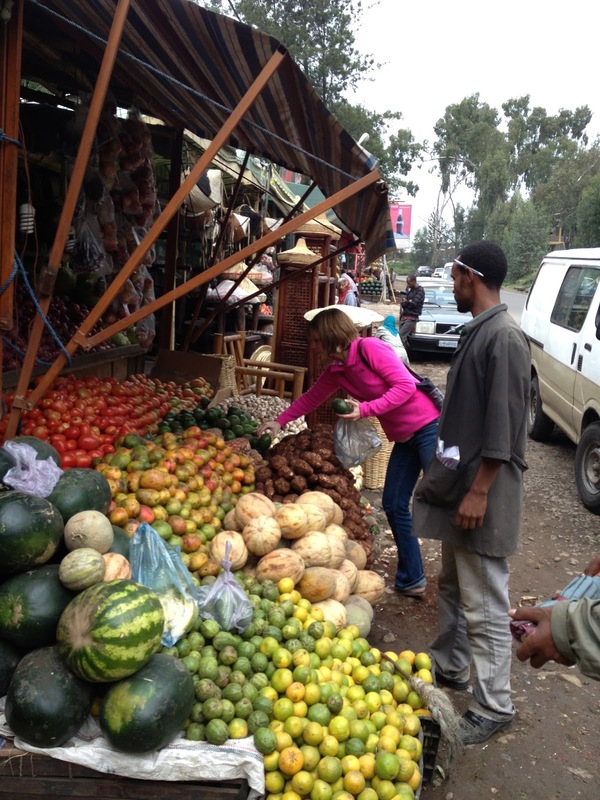 We will have potatoes, onions, carrots, cabbage, bananas and a bread type roll available in Injibara. In a city 1 ½ hours away, we can buy eggs. We shopped for hours. It was unsettling to feel so incompetent at a task that should be so easy. So many stops, looking for specifics, not finding it, finally finding sugar hidden in a back room. We bought food for our next two months. Soon, we know this stock up process will be second nature. The Littles love Ethiopian food, which is a huge praise. 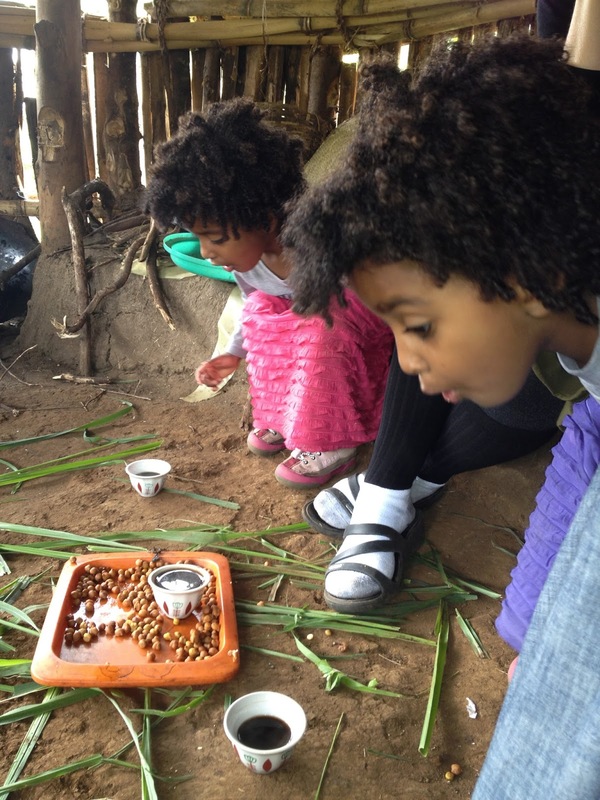 Their first meal here of habesha food, they out ate Jon and I. This is wonderful because it reduces stress in the eating department. We leave early Monday morning for our 8-10 hour drive to Injibara. The excitement has built to see our new home and for our summer there. 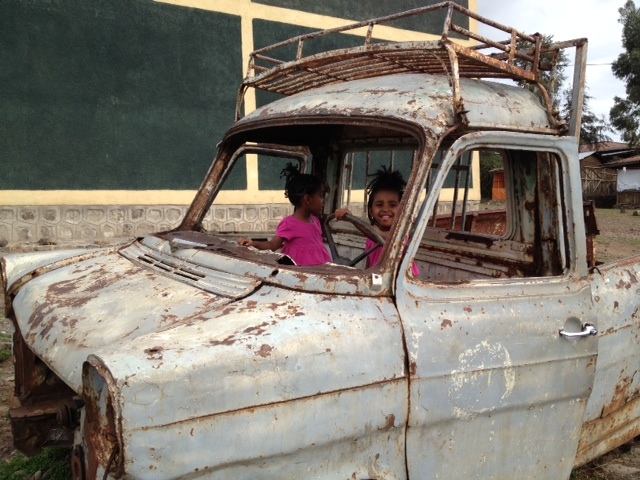 We will drive to Bahir Dar on Wednesday to drop Mom off at the airport. She will fly back to the US on Thursday. 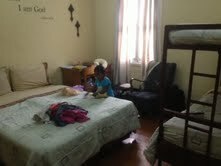 Until next Monday, we are staying at SIM Headquarters in Addis Ababa. Throughout the past year, we have had multiple trainings in community. It always has it's perks and it requires flexibility. :) We had no water the other day and it was amazing to watch lots of people completely take it in stride and no one was freakin' out. I did not publicly freak out but did feel immediately greasy upon the notion of no shower in the morning. The shared living space. We eat at the tables through the archway. Breakfast, lunch and dinner are prepared. We come when the bell rings. 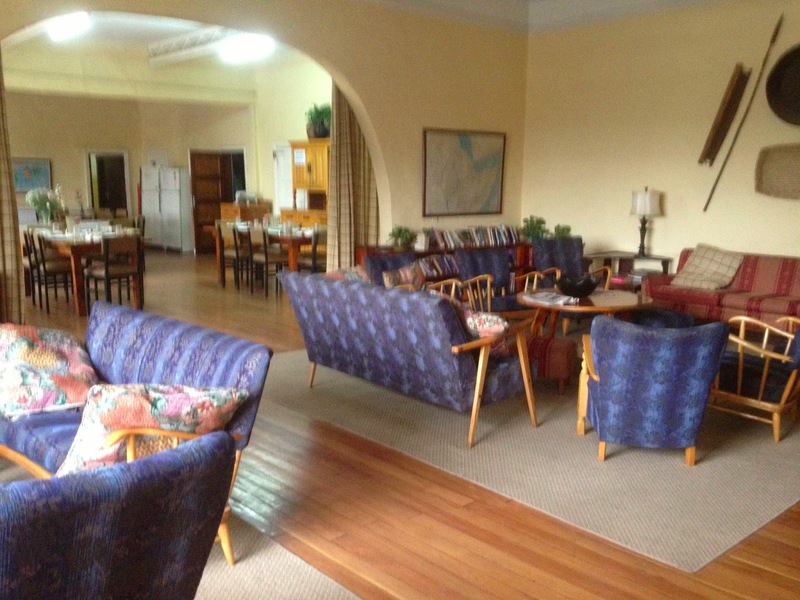 Much wonderful fellowship happens in these spaces. The beautiful garden outside of the guest house. The playset is behind the flowers and has been well used by two little girls. 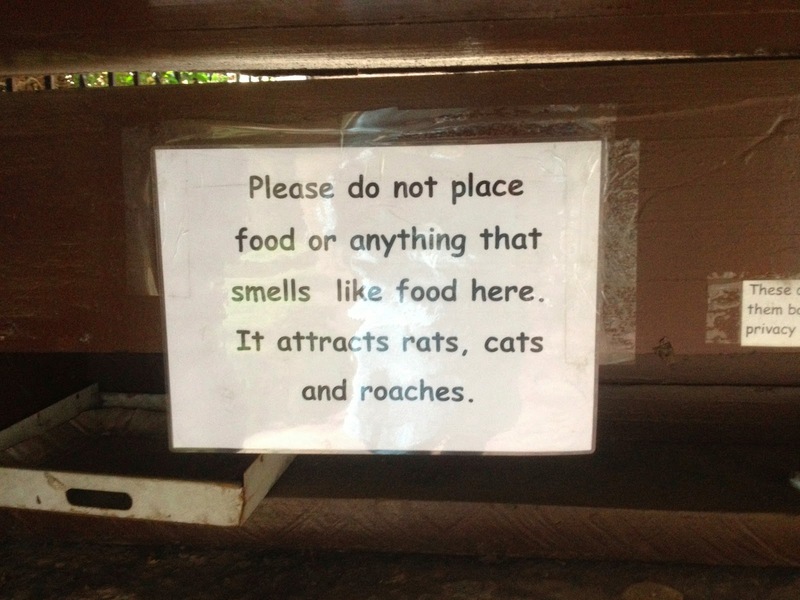 There are signs like this in multiple places. Very motivating to clean up after ourselves. Nana and The Littles spend much time in the toy room. 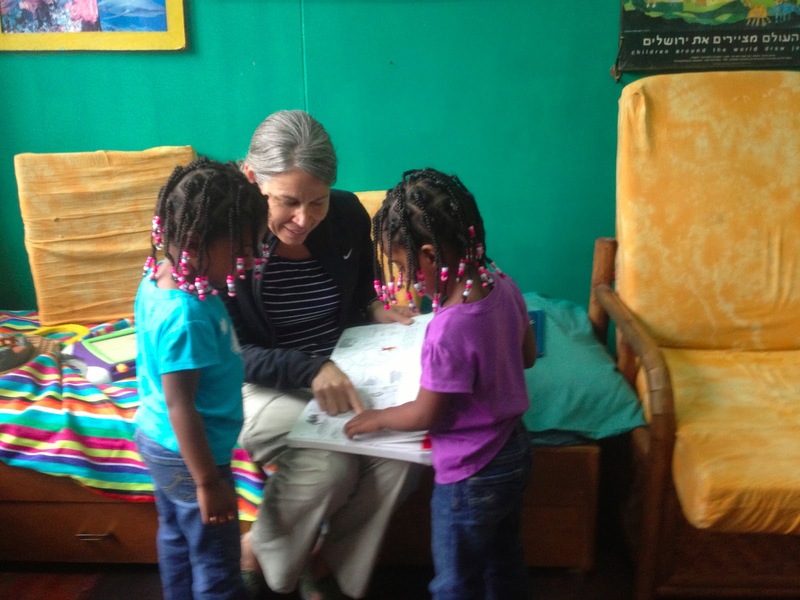 A bit grimy, but the Littles delight in the toys and books. Everyday you can have your laundry done. The weird part, everyone in the guest house puts their laundry in the same baskets and then after four, it is ready for pickup. And then you dig through stacks of peoples laundry, searching out your items. Sorting through stacks of men's underwear, looking for Jon's, the hilarity of it struck me. Then looking for my underwear, hmm, are these mine? Right color, wrong material. Our room. Because we are the only family with kids right now, we have our own bathroom. It's just down the hallway. Mom has her own room but has community showers and toilets. This is helping us all sleep better. Because if The Littles don't sleep, neither do we! A man, severely handicapped, sat in a wheelchair and used his hands to tap the legs of his comrade to direct the blind man pushing him across the crazy Addis traffic. I will say it again. A blind man was pushing a disabled man's wheelchair. Together they were using their strengths to cover the other's weakness. It is hard to get photos here. People don't appreciate drive by photos, taken paparazzi style but I wish you could see it. A city built for less than 2 million people is straining under the weight of over 4 million inhabitants. It's literally teeming with life. It's raw, beautiful, overwhelming and mesmerizing. Pregnant with grief and hope. We spent Tuesday afternoon running around trying to get our Ethiopian driver's liscense. Our first stop was the US Embassy where we watched families finalize their adoptions, and guessed by watching into the other people's lives what they were doing at the embassy. Where they getting passports for the US? Getting married? We finished the process this morning! 3 stops. It went smoothly, so thankful as we have heard it can take three days! That is until I heard that I have to pass a road test. With a manual transmission. In the city. You guys, I don't know what I am going to do. I cannot tell you how crazy traffic is here, people and animals and cars and no lane delineation and horns and vehicles going the wrong way. As you have witnessed, I have driven a stick, but like four times, in flat Indiana. Addis is also high altitude and has so many hills with traffic kissing your back bumper. This leaves absolutely no room for backsliding. I think this may be something that I practice in Injibara this summer. It's mountainous, but much quieter traffic wise. I would just really not like to run someone over or have an accident my first week here. So I guess I have the paper but am not really road ready.